Yep, I had to get into the holiday spirit, and with the crass commercialization I was not feeling very Christmas-y. I was very close to saying, “Bah, Humbug!” My small hometown put their OVERLY DONE Christmas decorations up the day after Halloween, and all the department stores had begun putting out Christmas items back in September. “Bah, Humbug!” Indeed. 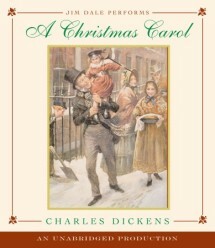 So what better story to get me back into the Christmas spirit than this Dickens classic. There are many versions out there to choose from and I’m not sure why I loaded this one onto my iPod, but I did, and no matter what the reason, It turned out a great choice. First of all the talent of the reader Jim Dale, was enough to get me into the Christmas Spirit. His vocalized perfectly all the parts, from the charity collectors, to the two talking Spirits of Christmas Past and Present, and Marley’s ghost and of course, Scrooge himself. Jim Dale’s acting was more than just acting out the voices and characters, he also was able to put just enough change in his vocalization of Scrooge to show the moments he changes and then the contrast between old Scrooge and reformed Scrooge were perfect without losing the character himself. Glad I discovered this version. The story itself is a great one that tells that a man can change his destiny, and one man’s life affects many. Scrooge, the stingy, business only, owner of Scrooge & Marley’s money changing, thinks Christmas is just another day and doesn’t think anyone should raise a fuss. When approached to make a donation to help the poor, his response of asking, aren’t there prisons? shows what kind of man he is. He doesn’t even allow family to share in this cheer. On Christmas Eve, Scrooge is visited by his former partner who died years past, Jacob Marley. Marley warns Scrooge he could end up like himself with heavy chains to bear, unless he changes his way. Scrooge only sees this as a nightmare caused by indigestion. Marley then warns Scrooge about the 3 coming spirits that will show him the true spirit of Christmas. The first is the Ghost of Christmas Past who reminds Scrooge of how he used to be and how he gave up cheer for business, making his love interest a thing of the past. Scrooge begins to see what is meant by the Spirit of Christmas. The second, the Ghost of Christmas Present, is the one that shows how what he does affects those today. Scrooge begins to see even more when he is shown the home of his employer, Bob Cratchit, and their disabled son, Tiny Tim. When the spirit uses Scrooge’s own words about the health of Tiny Tim, Scrooge is determined to change. The real Change comes when Scrooge is visited by The Ghost of Christmas Yet-to-come. This ghost is a haunting spirit that never talks. Scrooge is shown his dismal future and all at once the man knows what he must do. Upon waking on Christmas day Scrooge is a changed man and begins a new life by helping his fellow man and spreading Christmas Cheer. A classic you can’t miss and especially with Jim Dale narrating.